We're getting close to Christmas, so I can be a grinch. This seems like an expensive way to get out of going out and taking photos. Or doing the laundry. You can convince yourself you're doing something important when you'd be much better off letting professionals with the best possible commercial equipment do the job for you at vastly less cost. I sent all my old slides and prints off the Bangalore and 4 weeks later got back gigabytes of beautiful scans, dust removed by machine AND software, in Dropbox and on CD. All for less than the sales tax on that Leica rig would cost. One of the things Henning forgot to mention, and which I'm sure he's aware of, is that Micro 4/3 has a different aspect ratio than 35mm film. This means some cropping will be involved, either when framing the image or in post. An APS-C or DX format camera has the same aspect ratio as 35mm full frame, so no cropping is necessary. This is not to say that one format is inherently better than another, only that the difference in framing is something to keep in mind. I also digitize with the Olympus E-M5 II (with 60mm macro), using the high-definition mode. To position the camera over the lightbox I use a Manfrotto tripod with horizontal arm, with an attached Olympus OM focusing rail to zero-in on the correct distance, before the exposure with AF. I digitize by sandwiching the strip of five negatives between two 1/8"sheets of anti-Newton glass, to prevent Newton rings which will spoil the image. The AN glass can be ordered from Focal Point, in Deltonia Florida. The process is so easy I have now gone back to shooting mostly film. I develop my own B&W, but for C41 I had to experiment with the three remaining labs in Arizona -- two were sloppy, but fortunately one does a fine job, leaving no particulates in the emulsion. I still use my Nikon 5000ED scanner. It's attached to a MacPro and I can boot it in either the current Sierra (10.12) or Snow Leopard (10.6). The latter allows me to use NikonScan for image acquisition. It works well. One of these days...um, years...I'll complete the project. Still several thousand slides to go. You have missed a crucial, at least to me, aspect - dust, dirt, scratches, etc. The better dedicated film scanners, and even some flatbed scanners with illumination and holders for film scanning, have an IR channel which allows automated dust removal. This is, in my awed opinion, MAGIC. No spotting!! It does not work with silver based B&W film. It didn't work at all well with Kodachrome until recently, when both SilverFast and VueScan figured out how to do it. I have the equipment, copy stand, slide/film holder, macro lenses etc. to do it your way. I've tried it; I didn't like it. I have one imaginary friend* who digitized several thousand slides with a similar set-up, using flash under a glass holder with stops for slide placement and a macro with sufficient DoF to avoid individual focusing of each slide. Needed only when changing to different mounts. He was happy with the speed and perhaps had cleaner film/technique than I. He had also had a lot of trouble with his Nikon scanners, including subtle halo/auras around highlights that cleaning and Nikon service couldn't correct, and gave up on them. OTOH, Tiny Manley, a moderately well known Leica photographer, who has done stock all her career, is still scanning some of her 10s of thousands of frames of B&W film and slides. She uses Nikon scanners with auto feeders with success, although is also a little bothered by the halo problem. As to software and old computer/OSs, it's true most software that came with scanners is defunct, but VueScan is inexpensive and with excellent support. Yes, there may be a moderate learning curve foe some uses, but the results are excellent. It comes with it's own scanner driver that supports practically any scanner ever made. BUT, Windoze only, which is fine for me. Personally, I use a long discontinued Canon 4000FS film scanner (with back-up). It has much greater DoF than the Nikon, Minolta, etc. scanners and a more diffuse light source than Nikon, which doesn't exacerbate scratches. Yup, slow per frame, and only sticks of six frames or four slides per batch - BUT - will do those unattended with VueScan while I do other things. * Known for years on the web, but never met in person. The fastest 35mm scanners are the Kodak Pakon. I didn't know about them until 10 months ago, and now I am using an F335 to scan my 35mm/XPan backlog. It scans an uncut roll in LESS THAN A MINUTE - take a moment to let that sink in. 2000x3000 pixels for 35mm, and 2000x5465 pixels for XPan. The quality is definitely good enough for web posting. Being Kodak machines, the software does an excellent job optimizing the colors. They are ex-minilab machines and originally sold for $10,000+, and used to be available for hundreds of dollars. Now that people know about them, even the low end F135 goes for $800-$1200 now :-/ You will also need a dedicated XP machine or a VM, but a real XP PC can be picked up from free to under $100. It even does B&W well! Anny winner gets scanned by the Flextight, the Rolls Royce of scanners, but as above image shows, the Pakon really is pretty darn good enough! Thanks, that's an interesting article. Glad you touched on fine grain B&W film and multi shot. A few examples would have been nice to illustrate the differences. It's a technique I've thought of using myself as no one is making modern scanners anymore (no spare parts for mine now). There's a gap in the market for a pixel shifting monochrome sensor equipped with a three shot RGB LED. I'd be tempered to use a sigma SD camera myself as the thought of superimposing a Bayer array over film strikes me as an odd thing to do. Sorry - by pixel shifting I meant sensor shift to use a smaller sensor to cover larger film area and stitch together. There are of course a thousand variations on this method, but I think Henning's opening picture of the Aristophot could put some people off. [Good point Peter--I added this to the caption. —Mike] You don't really need this level of hardware. I use the Novoflex Castel-Cop-Digi to hold the film, which in turn fits into the Novoflex Castel-Q focusing rail, on which the camera is mounted (Both available from B&H). This solves the focusing issue and keeping everything planar. The whole thing then mounts on any tripod. I also use the OMD EM-1 Mkii, as the camera, but for illumination, I use a flashgun behind the negative, connected by cable to the hot shoe on the camera. It puts out a fast series of pulses for each position of the sensor (when using sensor shift - recommended) or one flash otherwise. Another point: The lens must not focus-shift. That is, you need to be able to focus manually at full aperture, then stop down to f/5.6 or so, with no change in the plane of focus. You need to check this on your lens. It does go fast once things are set up, but now you have a card full of negatives that need to be converted to positives. I use Photoshop to invert each file in a batch action. Which is very simple. I don't think this can be done in LR (someone may know better). For slides, it's simpler still, but if you are copying colour negatives it gets much more complicated. It can be done, but I would find another method if colour negs are what you need to 'scan'. Thanks. Very helpful. Wondering, though, what others use as a stand for this kind of work. That is a very nice starter, thank you. I hope there is a part two! I find the Epson V500 Scanner adequate for most purposes. I use a very similar set-up but with a Nikon Multiphot, 65mm Macro NIKKOR for 35mm film and a 120mm Macro NIKKOR for 120 film. Camera a Nikon D4. I use the Multiphot's collated light source but almost always adding atop the condenser lens a sheet or two of vellum, this effectively gives me 3 different types of light sources to choose from. An (orange) Ilford Antistaticum cloth to clean the film. To check focus, use a magnified LIVE VIEW image on the back of the Nikon. Focus is fine tuned using the Multiphot's lens stage fine focus knob. Results when compared to scanning the same film with an Imacon Flextight are essentially equal; but as you, I also prefer a RAW file over a tiff file. I use an older Nikon PB4 bellows attached to an good quality L bracket instead of a copy stand. The brackets can be bought at a hardware store and cost less than $10. Originally I used the Nikon 55mm Micro lens but later adapted an 80mm Nikkor enlarging lens that was far better. The trick to colour negs is getting a 6000K light source to overcome the orange mask. Using my d800 with this setup has given me results far better than any of the Nikon scanners I've owned. Very timely topic. My Nikon film scanner just ceased working. I've got a Bencher copy stand with an illuminated table that hasn't been used for years. Currently it is holding camera bits and bodies, and just gathering dust. Just wondering aloud here - I suspect that using my Nikon D610 FF camera using something less than 1:1 would restore autofocus functionality - correct? I remember the Bowens Illumitran thing for slide copying (basically it was a copy stand with fancy light source), and there were one or two others. Friends seriously into slide copying had some of them and I worked with them just a bit. Interesting that today the illumination is being treated as relatively simple, not the big problem. The Honeywell Repronar was another item in that area, and I vaguely recall a third one, possibly by Wein? I've been solidly stuck in scanner mode myself. One thing I wonder about -- what's the actual brightness range of the illuminated slide? And how does photographing deal with that compared to scanning? Scanning, at the home level (Nikon Coolscan 5000 and below, I guess? ), is often limited by the density of the slide (can't handle the dmax). I'd like to see some discussion of that. And for negatives...do you end up stretching the contrast a lot in post? And is there enough bit depth for that? Even with bad exposures? I'd like to thank Henning for writing this interesting article as I know how much time and effort is involved. For me personally, though, this rig is too expensive, too complicated, too much effort, and too large (wouldn't fit well in my small condo). I would like to know, though, where Chris sends his slides and prints to in Bangalore. Slight correction to Moose's post above: VueScan is available for Mac. I have it running on my MacBook with OS X (Sierra) and it works great with an old Minolta 5400 scanner. My other rig, aside from using the negative scanner, is a Nikon D810 mounted on a copy stand. The lens is an old Leitz 100/4 macro lens and bellows. (I modified the mount of the lens to work on the Nikon body using an adapter ring/kit available from Leitax, who, originally made their adapters for Pentax bodies.) At the bottom I have an old Omega color head, inverted (bottom side up) with the light coming shining upward. I am using a 25x37 Leitz negative carrier with anti-newton glass. Set the camera on auto exposure and it works great. Hi, all, One thing no-one's mentioned....HAVE SOMEONE ELSE DO IT...if you want them before next year.... reason...it'll take forever, since every slide you pull out of the box or magazine will trigger memories which flood back and slow you down ! Memories of old acquaintances, (girlfriends?) places, holidays, -- -- I started doing all mine with a Canon 7D and 60mm EF-s macro mounted on an old LPL enlarger with a tablet showing white light as a lightsource. Used 'Auto", and got beautiful results where the set-up automatically compensated for under and over exposed slides. The dust was a problem for a while, but only a few are really going to be manipulated further, so I can live with that. The Agfa CT18 had shifted towards purple , but a few clicks in Lightroom brought some good (repeatable batch) results. Gee Kodachrome 25 and 64 were amazing films! The Aristophot is hardly necessary for the basic technique; it just illustrates what is out there. A friend at a University had used this for his work for many years. Then it became redundant. I acquired the whole setup, including two Leica MDa cameras for slightly more than what I then sold one of the MDa's for, so now I have that wonderful setup for about $100. If I was now looking for a decent stand to use, I would begin by looking for an old enlarger and a geared macro rail. As others have pointed out, this is hardly the only way to do it and there are both higher quality and faster ways to do it, but with autofocus on m43 it's fast (up to 400/hr) with results that let me see all the grain if I so wish. I could send the stuff off to India and get everything (hopefully) back all processed, but I have the equipment at hand, have some time now and don't find it a pain if I only do it a couple of hours at a time. Scanners that use an IR channel and reasonable software can sometimes be helpful, but mostly only for chromogenic films, i.e., colour negative and E-6 and the like transparency and B&W film. Unfortunately, most of my horde is B&W (predominantly Tr-X and HP series and Kodachrome. These don't play well with the IR channel. Fortunately my material is relatively dust free. I haven't tried the latest scanner software that is mentioned, but as my Nikon scanner is hugely slower than my method, I'm not going there again. Spotting in LR is fast. I know Tina Manley, and that she has been scanning diligently for years and will undoubtedly do it for many more years for her stock portfolio, but she has certainly spent a LOT more time per image on it than I have. I scan on a cheap flatbed. Print small. The winners go for Creo wet scans at $125-175 ea. The Kodachrome scans print 30x40 easily. Most black & white (Neopan Acros 135) print 20x24 with no issues. There aren't many film scanners being made any longer. Units like the Creo IQ2 are tough to maintain.I really like the look of pigment prints but; maybe it's time to wet print again?
" If I put the Zeiss on an extension tube . . . the sides of the negative/slide will turn to mush." When I tested my C-U/macro lenses a few years ago, the Oly 50/3.5 1:2 Macro tied for first at 1:2, but was still quite good @ 1:1; flat field and corners still good. But I would use their 80/4 Auto true Macro bellows lens, optimized for 1:1, for this, which is how I tested it. "Wondering, though, what others use as a stand for this kind of work. " Aside from the very expensive Leitz Aristophot and Nikon Multiphot, it depends in part on how you plan to hold the film. When I tried this approach, I used part of the excellent Olympus OM System macro gear. This illustration shows how the Auto Bellows, 80/4 Auto 1:1 lens and Slide Copier work together. As it is all a rigid piece when put together, it doesn't much matter what holds it, other than to make lighting convenient. I put it on a tripod close in front of a bookcase on which I put one of those cheap daylight balanced 4x5" "light tables", which worked very well. The Slide Copier is well built, with spring loading, so one only need refocus when mount style/thickness changes. I don't have the roll film accessory, as I have no film rolls, but the holder easily accommodates strips of film. I know there were other, similar solutions made. If you are going to put the film flat in/on some holder, you need a vertical stand. There is an essentially infinite supply of old enlargers, at least some of which can be used as copy stands, as I have done. Again, Olympus made an ideal solution. Used set on a light table or a piece of opal glass/plastic with flash below and focusing rail and/or adjustable extension tube and macro lens, it makes a solid, compact set-up. It's hard to see from the pictures how solid and precise this gear is. I am working on a similar setup with E-M5 Mark II and Panny 45mm. I will be using a small Led panel and diffuser box and film holder from my old Durst enlarger. Question for Henning Wulff: why don't you use custom white balance? I still use the Bowens Illumitran 3s from the old days of slide duplicating together with a Canon 6D and 50mm Sigma macro lens. I was very happy with that system: it was fast and sharp enough to resolve film grain, but it did so in in a print-like way that was much more pleasing than the harsh, noisy look of the flatbed scans of the time. I've long had a plan to scan the collection of mounted slides, my wife's, mine, our parents, maybe 10,000 in all. My idea was to replicate the method I found somewhere on the web long ago. Remove the projector lens, mount camera with macro lens facing in, hack a suitable cool light source, not too bright and then automate the shutter and slide advance. I'm not expecting great results, just better than none. I have a Minolta ScanElite 5400 (3 or 4 slides per hour, max) for the best pictures. I already have 2 good Carousels and a Zeiss projector for the linear magazines, the Oly 60mm macro lens and an OMD EM5. A EM1/EM5 MkII or a Pana G8 might be better. But I haven't got the all-important Round Tuit, so I'd be interested to hear from Chris Pisarra or Dennis about recommended bureau services as an alternative. They used to be very expensive here in the UK. Vuescan works fine but I slightly prefer the results I get from Nikon Scan. That is a very scary rig you have there, Henning! I’ve not seen something like that since my last visit to a radiology department. I salute your process and intentions. But film scanning rates just below a colonoscopy in my book of fun things to do. (I can sleep through the latter.) I have two terrific old Nikon film scanners which have been collecting dust for years. On the increasingly rare occasions that I need to scan film* I’ve found my trusty old Epson VT750 to be perfectly adequate and about as convenient as could be. But to each his own enjoyments! * It’s been years since I’ve shot any film. But two years ago I began to casually pursue a project involving anonymous discarded slides. The tediousness of scanning is what brought a coma to that project. I’m afraid that I’d be inclined to take Dennis’s approach of outsourcing if I resumed the effort. I have a friend who's built motion picture scanners. 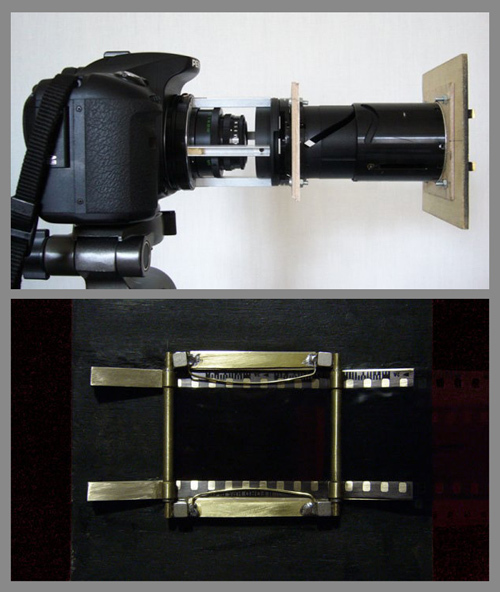 To scan his larger still photographs from film, he's built a similar set-up to what's described here. It works very, very well for slides and b&w negatives. But, and he's an expert, he showed me why it doesn't work well for color negatives. He said it was due to the color bayer filter array in the camera not being matched to the dye colors and orange mask in the negatives. Or something like that. I was convinced that for serious scanning of color negatives, one needs a true RGB scanning device. I wish I could explain it better, but I'm convinced. I only photograph my color negs to get a rough idea of what's in them, and then I select the desired frame and scan it properly, and very slowly, on my Nikon 9000 :) I have not been able to get really proper color photographing color negs with my Canon 5D. Just something to think about before investing in a "camera/scanner" set-up for color negatives. Chris P and others, can you let us know which service you use/recommend? I use a similar setup, horizontally but with the Olympus OM auto-bellows and slideholder. You can get adaptors for most mirrorless cameras to attach to the OM mount on the bellows. Adapting macro lenses to fit on the front is a little trickier, but an m4/3 adapter will work if one of the adapter flanges is shortened by filing a tad. I’ve used an OM Zuiko 80mm f4 macro (not APO, so shows color fringing on slightly defocused edges), a Rodagon-D 70mm f4 APO (the best), and a 55mm f2.8 Micro Nikon (poorer edges than the 80s). I’ve used the Olympus E-M5, Nikon 800E and Sony A7RII on the back end. The FF cameras definitely give better files, but pixel shifting on the newer m4/3 cameras sounds interesting. Mike, I'm not sure if you decided not to post my reply or if you never got it. I'm hoping for the second option. As I was saying, it's a nice article with good valuable tips -I'm happy to note my path led me to the same conclusions, mostly. Still I'd like to mention that this is truly only the beginning if one wants to digitize and invert color negatives. It truly is a very hard path to start and I'd be happy to see Henning's take on it. @John Smith, thank you for that link. I had been avoiding throwing out my ancient and utterly redundant XP tower system purely because I reckoned on not being able to use my old Nikon scanner on anything newer. These scanners were not cheap and I do think it reflects poorly on Nikon's support of and respect for their customers that they do not update the software to work on newer platforms. I’m glad to see that the important topic „camera scanning of films” is discussed in TOP, thank you for this! The most challenging part is the digitizing of color negatives, which I do hope, will be discussed in the near future also. The possibility of batch processing of these files is also essential. I tried the conversion of camera scans via Vuescan, which works, but somehow I’m not very comfortable with this workflow. As a possible alternative I want to mention the dedicated conversion software COLOR PERFECT and the associated software MAKE TIFF (to create linear TIFFs). Right now I’m in the first step of camera scanning several thousands of color negatives and will try this promising software in the near future. It would be great if some of the TOP readers could contribute their experiences with this software and workflow. A few years back, my brother fell into a remarkable 2 1/4" x 3 1/4" negative from 1938. It showed the west hanger for Hugh Watson Airfield, a business that my father would take over from Major Watson in 1952. Nobody local could properly drum scan it, and I really didn't want to let it out of my hands before I took a good crack at it. With a 39mm to 42mm adapter ring, a couple 42mm screw mount macro extension rings, and a 42mm to AI adapter, I was able to rigidly connect a 75mm APO Rodagon D copy lens onto a Nikon D7000. This setup was mounted on a vertical copy stand. The negative was sandwiched in a 4x5 anti-newton ring enlarger carrier, which was mounted on scavenged XY microscope stage, which was floated over a lightbox. Ended up taking 42 overlapping images, in a 6x7 pattern. Stitching was completed in Microsoft Labs free Image Composite Editor. Final image is ~180mpixels. The gentleman in the center can be seen holding a Speed Graphic. With little alteration, this hanger, and the two adjoining, remained under my fathers control, until the airport was sold, and closed by the City of Cincinnati in 2012. The following link details an example of this technique taken to its extreme: Cincinnati library 1848 panoramic daguerreotype scan Total image is from 8-6"x8" plates, with 1400 images being taken for each plate. I use a Sinar P with a Sony a900 body (24MP is sufficent for my needs). By the far the best lens I've tried is the Nikkor 120mm F5.6 AM Macro -- better than any shooting macro, enlarging or process lens I've tried. I have a full set of Beseler neg carriers (including the Negatrans and Negaflat) both glass and glassless. For alignment I use a Zig-Align. For lighting I use a diffused Sony F58AM mounted on the rail (TTL and then +/-). I've added a small, swing in (Sinar filter holder) LED source for focusing. The rig is big and clunky -- but the results are outstanding... except that every speck of dust is very well defined. I have scanned over 900,000 slides with my Nikon LS5000 and its bulk loader the SF240. I can set the scanner up and let it run without attention from me until I reload another 50 slides at a time. I do have a Beseler Slide Duplicator and have tried the digital camera duping but it requires much more time and attention from me. There is no way I could scan all of my film using the digital camera method. There is also the advantage of dust removal with the Nikon scanner. It saves me many hours! At last, a use for my Visoflex (the reflex housing that turns a Leica rangefinder into an SLR, sort of).